Alleged Galaxy S10 screen protectors hint at incredibly thin bezel, symmetry begone! A couple of screen protectors, allegedly for the Galaxy S10, are making the rounds in the Chinese blogosphere, and, if credible, hold a hint about a significantly trimmed top bezel. Not that the Galaxy S8 or S9 had thick toppers to begin with, but this here is something else and is as thin as in the "all-screen" sliders or dual-screen phones that got released in the last couple of months, yet the S10 won't be a slider. How could have Samsung done it? 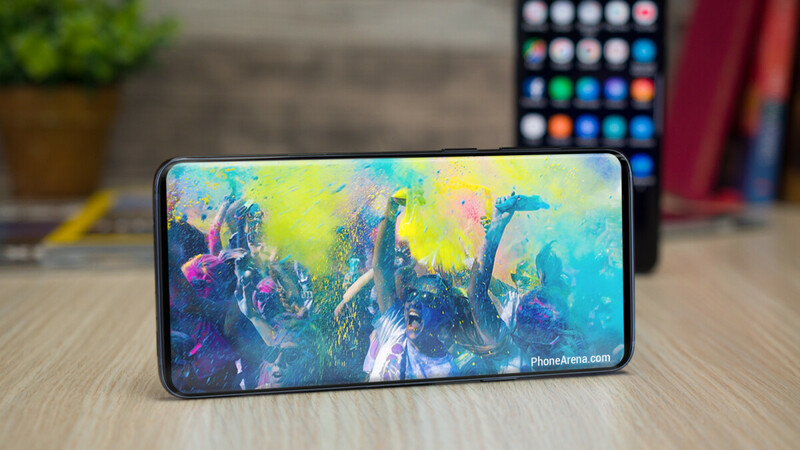 Well, the S10 is rumored to land with Samsung's new Infinity-O display type that sports the so-called Hole in Active Area (HIAA) technology, which is simply a laser-cut opening for the tiny front camera in the display package itself (not the cover glass, or the eventual protector on top of it). On one of the pictures, the earpiece has seemingly been relegated to the very edge of the phone, but it is still in the bezel, so the S10 might not have the sound-emitting screen that Samsung already demonstrated at the SID expo back in June. The protector types are listed as "3D glass" or "film" by their respective sources, though both look rather rigid. Only the alleged glass cover has an earpiece cutout at the very top while the other one sports nothing of the sort, so we can't really reconcile those differences for the time being. There may be no less than four Galaxy S10 models, though, so make of it what you will. Wow! It's near-perfect! There is almost no bezels and even the chin is smaller than the iPhone Xs! It makes the iPhone look like it has "chins" all over the place. LOL On the other hand, where will they put the front camera? Yeah, I wonder where they'll put it. Hole on the display. Same technology as with the LG Watch W7. The iPhone is a great design already regardless of the notch. They have lots of stuff to show in just one booth. Seriously? I dobut anyone will notice when the phone is on, just like I really don't notice the HONKING BIG notch on my XS Max (Unless I'm watching a VIDEO. (DARN you Apple and your perfectly smooth UI and CRAP load of quality APPs)) It will not be noticeable when using the device in any orientation. I wil making my Trek back to Android, when it arrives, but it will be hard as this Max is phenomenal. I would accept a chin from a chinese company but not from samsung, I wouldn’t mind a thicker side and top bezel just for the sake of symmetry. A chin? Dude that's not even a cleft. Plus, that's the border of the display that conects to the housing. Who're you kidding heh? You weren't going to buy it no matter what anyways. The fact that you all keep calling the bottom housing piece the chin is hilarious. Just builds my excitement for the next king...the Note 10. People are REALLY complaining about a tiny "chin"?? Is PhoneArena now full of 8 year old kids? Well it does look thick like an iPhone chin. Guess it's acceptable. Well there will be always that kind of comments, don't worry and ignore them. :)) There are plenty of normal people as well, It seems like it's the majority. the slight chin is helpful, you dont want the screen to make direct contact with you palm when holding it. not getting what is supposed to be a massive upgrade and amazing phone all because of a slight few mm of black chin is just being foolish. Damn this is just making me drool on the possibilities of the Note 10.
i prefer thicker top bezel so that it has the same thickness as the chin. i wonder how the front camera will turn out, as the infinity-o is a major turn off for me.